It’s Monica, I recently had the opportunity to attend a multi-media of the tale of the truth behind the Epic battle over Diego Rivera’s art, for the 79th anniversary of Diego’s Detroit industry experience presented at the Elizabeth Theater downtown at the Park Bar. Was I impressed with Diego’s work, of course I was. Who wouldn’t be interested in the frescos displayed at the D.I.A., his emphasis to capture the truth behind the manufacturing and labor force movement in Detroit caused as much controversy for him as did credit. However, I have to admit I was more overly overcome with Diego’s wife Frida Kahlo, who I have been a fan of ever since I can remember because of her ability to embrace both her femininity and masculinity. As a child my mother would speak of her with such high respect and remorse because of her talent and because of the sufferings she encountered. Frida was also known as a political communist which was extremely rare for women in her time, women in this era were mainly homemakers. Not only was she a political activist, a painter who painted from the heart, she was also a fashion icon. Can you say that about Picasso, Van Gough, or better yet Diego? 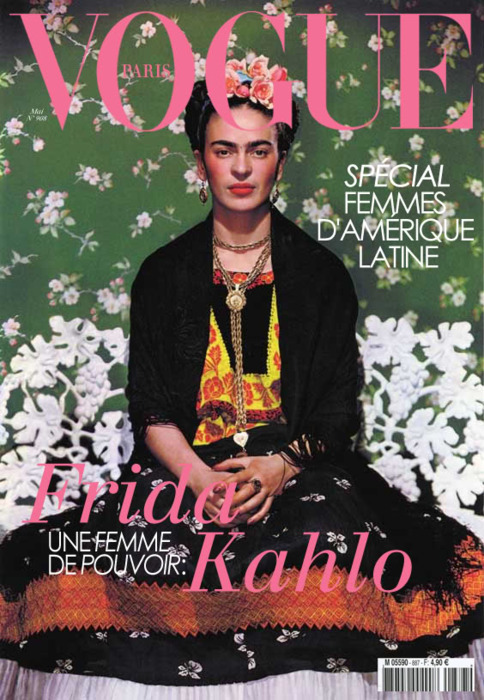 Don’t get me wrong I am a big fan of artist like Picasso, Van Gough, and Diego, but Frida was in a league of her own, she became an international sensation in the 20th century known for her radical political views, art, and fashion, once again proven that we women have the ability to multi-task. I don’t know anyone else who could pull off what she wore with confidence, especially when visiting the U.S., most people immediately try to fit in, not Frida from the many layers of jewelry, to the flowers in her hair, colorful ensembles, and scarves, oh and you know the braids that everyone has been obsessed with lately, Frida wore them back in 1930s. It was no wonder she was featured on the cover of the Paris Vogue magazine. Frida truly embraced all things feminine as a fashion icon even though some would argue otherwise, thus is the reason this coffee book is displayed on my coffee table. Might seem odd but a lot of her awesome work was also inspired by the fact that she had a miscarriage in Detroit, truly a great artist. That is correct she was cared for at the Henry Ford Hospital.